Moving, downsizing, or emptying a loved one’s home requires careful planning and an exhaustive list of things to do. And coordinating with many other people is physically and emotionally taxing. Need to organize your home and bring calm back into your life? We offer services to help. Need assistance getting items packed and ready for your move? We offer services to help. 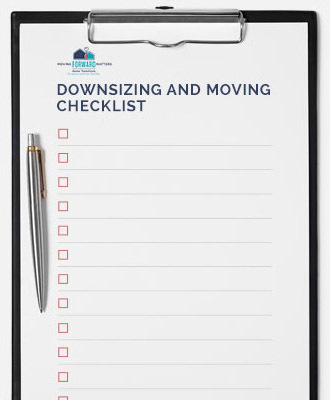 Want to downsize your property and your home? We offer a wide range of services from full planning & consulting services to hands-on one-on-one help. Would you like a move management consultant to help you coordinate all the pieces of your move including move-day and settling-in services? We can help. Pre-listing services help you get your home looking great to sell for what it’s worth and fast. We are connected to experienced professionals and experts who will help you through your home transition. We offer both practical moving services and more importantly, the emotional support needed so you are not alone or overwhelmed throughout the process. "Excellent communication, smooth planning and execution of the move plus the personal touch that is so important for the family. The pictures of the belongings and itemized lists per box are so helpful. Thank you for a job very well done." "Very good, caring, personalized, friendly service!" "Quick response to our original request, clarified the deliverables, worked unsupervised, called upon completion." "My MFM ladies were very friendly, knowledgable and helpful. They were fast and effecient"
"Lucille was knowledgeable and very pleasant to deal with. She and Michelle did a wonderful job of setting up the apartment. The looks on my parent-in-law's faces as they walked into their new retirement apartment and saw so many of their belongings from Toronto was wonderful. Many thanks, Peter & Judith"
Pierrette and her team were quite literally a godsend. Their services were worth every penny. Both my brother and I live in different cities from our aging mother who was recently diagnosed with Alzheimers and needed to leave her home. The thought of dealing with the logistical challenges to pack up our mom’s house, on top of the emotional stress of dealing with her health issues, was daunting to say the least. Pierrette and her team came into the house and literally did everything efficiently and smoothly even though furniture needed to go to four different family members across two provinces. Without her, this transition would have been exceedingly difficult and emotionally draining. My family can’t thank her enough for all the professional help and support through this trying time. I was in need of assistance to help sell and empty my father’s home. I was very anxious as he was in the hospital following a fall. Since I do not live in Ottawa, I was trying to manage all things from a distance. I really appreciated your professionalism and your ability to start on such short notice. What impressed me the most was that you were organized and had a great staff. You were also connected to other companies (i.e. 1-800-GOT-JUNK?) and you provided support and encouragement, as well as professional services. You provided “the personal touch”. I highly recommend your services. You are #1 and you are the only service of this type that others looking for help should consider calling. I would like to emphasize the professional, organized and supportive atmosphere that your presence created. Thank you for the emotional support you provided. You listened, you cared, you were very empathetic and sympathetic in a very difficult time. Thank you!